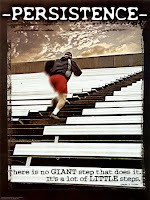 Persistence - one step at a time. Have you ever felt despair, desolation, sadness, frustration, anger, hopelessness? Good, that means you are alive! Most of us have felt one or all of the above at a given moment in life, or every day for a while ...There is nothing wrong with that. What matters is what you do with those feelings and how you respond to them. When faced with loss, challenges and change, we are presented with the biggest opportunity to find out who we really are and the stuff we´re made of. I don´t have a “holier than thou” outlook, nor do I believe that suffering is the pathway to heaven. I can affirm that the many challenges I have faced in life and how I responded (and respond) to them have taught me a lot about me. I know that even if I lose ground temporarily in the face of adversity, I don´t give up. Rejection, loss, bad news … does temporarily bring me down. I´m human! But it does not pin me down. I know that persistence pays, and that even when I may believe everything is lost, in fact nothing is lost. I look inside and see how much strength and compassion I have gained and then I get a second wind, and keep on going. Because I have a track record of getting up and dusting myself off after every fall, I believe in myself. Not always, not every second of the day, but for the most part, I do. The biggest favor we can do ourselves is to be persistent. It is the only way to overcome obstacles, to achieve goals and to gain self-respect. For some people, it is the only way to live. What have your biggest challenges taught you about yourself? 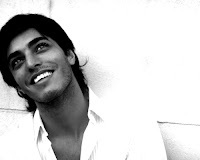 Nicolás Manservigi, Author and Singer, publishes his second book at 25. In 2002 my book The Challenge of Writing and Publishing was released. I was living in Spain then and one night I received an e-mail from a teenager in Argentina named Nico, who had read my book and told me he wanted to write and publish. Being a published author takes you places. It connects you with readers. Some write to you once, then you write back and that´s the end of the exchange. Other times, the relationship continues, often through time and distance, and you get to experience the reader´s evolution – perhaps even watch his writing career unfold. This was the case with Nico - Nicolás Manservigi - who was first my reader and then - I became his. He published his first book, El portador (The Carrier), in 2007 and I interviewed him for La Palma, of the Palm Beach Post. He did not stop there. His book Paisajes internos (Interior Landscapes) will soon be released. He is also an opera singer, he writes scripts, and he´s got the looks. Born in Tucumán, Argentina, at 25 years old, he´s already achieved more than many people twice his age. “I would say that most of what has happened in my life has been a success. Some of the things I have overcome are my insecurity and low self-esteem. Having conquered that, I became an opera singer, wrote and published novels and have written film-scripts. The biggest success comes when you decide to pursue your own happiness,” says Manservigi. Manservigi says his parents, brothers and close friends have supported him all the way. Despite his appearance of having it all, he still has doubts and moments of insecurity. He does not stay in a slump for long, however. I first read Wayne Dyer´s Your Erroneous Zones when I was 17 years old. Back then I had an eating disorder and I was doing everything I could to overcome it. Dyer´s book struck me as a manual of common sense that few people I knew (to include myself) seemed to abide by. Almost 30 years later, I still read Wayne Dyer, who has gone to write and publish over 30 books, many of them bestselling titles, and all of them reflecting his own spiritual evolution and, dare I say – my own. I eventually did overcome the eating disorder, and learned a lot from that experience, which drove me to write and publish a book – I Feel Fat – about it. 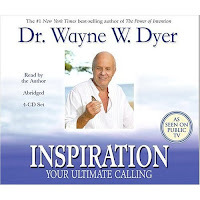 Just yesterday, during an evening run, I was listening to one of Dyer´s audiobooks – Inspiration, Your Ultimate Calling, which I have read and listened to many times. But yesterday in particular, a few phrases struck me as never before. One of them was: “There is nothing more powerful than an idea whose time has come”. It resonated with me, as I am now fueled with passion and focused on an idea that fills me with energy, excitement and strength. Another concept I could relate to was that when we are in tune with our gut and decide to follow what makes us feel good, excited, vibrant and alive, we owe it to ourselves to pursue it relentlessly, because it is our life-purpose. In order to succeed, we will have to keep on doing that which makes us feel energized and on-track, and do away with the low-energy activities, conversations, company and even work that drain us. We often accept certain company, jobs or assignments out of fear. We may be afraid of being alone, of not being able to pay the bills, afraid of not having food in the pantry, fearful of what others may think. Fear is often a fabricated emotion, based on what ifs, and we can decide to let go of it. It really is as simple as that. Our emotions follow our focus, always. Make a list of those things, people and activities in your life that make you feel powerful, joyful and strong. Then make another list of the people, activities and work that make you feel weak, doubtful and even depressed. Commit yourself to the first list and eventually eliminate the second from your life. Simple? Very. Easy? Not so much. But, trust me, it´s worth a try! Eliana Tardío, Author and Mom, makes Awareness of Down´s Syndrome her Life-Purpose. Eliana Tardío is the mother of 2 children with Down´s syndrome, and they are not twins. For some people, this could be an excuse to crumble and to lose hope and faith in life. Tardío, however, turned this twist of fate into fuel for her life-purpose. Born in Bolivia 32 years ago, Tardío always wanted to be a writer. She is now a two-times published author, and her books are named after her babies. Emir of My Life, Leader of my Soul, is the heart-felt story of her pregnancy and the birth of her first child, who is now 5 years old, and Ayelén, the Joy in my Life, is dedicated to her second child, a girl. She wrote these books as a catharsis and also to share her experience and give hope to other parents of children with Down´s syndrome. More than a mom, she is also a successful professional serving the Health Department of Collier County in Florida and Healthy Start, as a Family Specialist and Educational Outreach. She is now writing her third book, and she is also a leader and advocate for parents of kids with special needs around the world. Tardío created a social network in Spanish: www.redsocialelianatardio.com/, for this purpose. Tardío claims that the feeling of love has helped her in her journey, as well as perseverance and patience. If doubt creeps in, she looks back on all the things she has managed to accomplish, and feels empowered. Tardío believes life´s challenges are required to become stronger and that both the good times and the not-so-good moments must both be celebrated. Eliana Tardío is my antidote to feelings of “having a bad day”. If she can write and publish books, free-lance, network, keep a job or two, devote time and effort to her children with special needs and her husband, and always wear a smile and have a great attitude, anyone can! 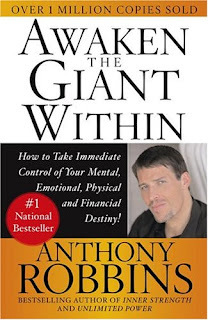 I´m finally reading Anthony Robbins, 26 years after first seeing him in an infomercial on TV. All I saw then was a 23-year old flashy-smiled king of hype. Since then, every time I heard his name, I cringed. I´ve always tried to lead a life of self-improvement, however, and with experience and age, I have become open-minded and mellow. Tony Robbins has after all, built a multi-million dollar motivational empire, and it doesn´t hurt that he is now a weathered middle-aged stud that looks like he stepped out of the cover of GQ magazine. What have I found so far in Awaken the Giant Within? Well, to be honest, the book is poorly written, redundant and has plenty of filler. I thank the stars that I´m a speed-reader! Properly edited and slashed to a fourth of its length, it would be – at least for me – an excellent read. It is surprising to know the high standards required to break into publishing, and yet a book that has sold over a million copies seems not to have been revised so far. It does not hold up to the standards of excellence that the author stands for. Technicalities aside, Awaken the Giant Within does give practical pointers that, if applied, will work. 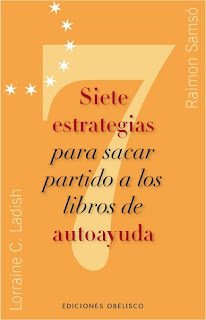 When a self-help book “doesn´t work”, it has to do with the reader not doing what it takes to put the ideas in practice. 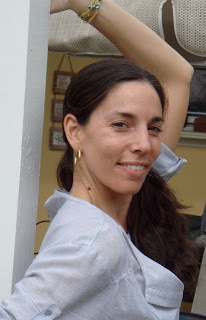 Don´t I know – not only do I read self-help books, I also write them (smile). The one concept that I take away from Robbin´s best-selling manual, for myself, is his explanation of how when you are driving a race-car (not that I plan to ever drive one) that is skidding, if you look at the wall in fear, you will most likely hit it. If, however, you manage to keep your eyes on the road ahead (your goal) even as you lose ground, you tend to get back on track, because your hands will follow your focus. And so it is in life. Sometimes, all we need is to grasp one simple concept that will help us redirect our efforts and catapult us to success. This was my eye-opener. Even if circumstances cause us to skid in the opposite direction of our main goal temporarily, if we keep our eyes on the goal no matter what, eventually we will be on course again. 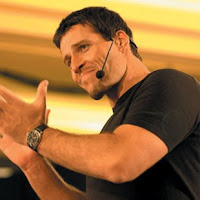 If you read the book or have seen Tony Robbins live, I´d love to hear your impressions. Be Fashionable, Be Fabulous, Be Yourself! When I free-lanced for La Palma, of the Palm Beach Post, I was very fortunate to feature Monica Kennedy, founder and owner of TuffCooki Handbags. She came across as a positive, passionate and strong woman, determined to make her business soar despite being pregnant with her second baby. Born in Madrid, Spain, she moved to the U.S. when she was 16 and obtained a BA in Business Administration. That was not her calling, however, and Monica realized she was in fact passionate about design. She launched her line of TuffCooki (her own nickname) Handbags in 2004 and 6 years and 2 children later, she is still going strong! “Be Fashionable, Be Fabulous, Be Yourself” is her tagline. Monica started out designing and sewing a few handbags in her own home, and since then has positioned her product in online stores and brick-and-mortar boutiques. 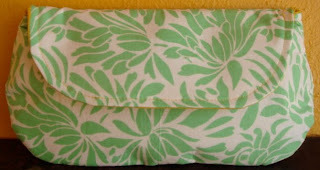 She custom-designs in small or large quantities, and enjoys what she does. “It has been a great trip so far, with its ups and slow times, never downs to me”, says Monica. “So far I have done it alone, with my family´s support and friends who believe in the idea. I love a challenge and the harder it gets, the more I want to make it. Quitting is for losers and I am NOT a loser”, she adds with a smile. “My husband Caleb has been a great support”. When she launched her business Monica had no experience, but she quickly learned everything from ordering, shipping and accounting to website launching, designing, sewing and selling. She says she is a one woman-shop and intends to keep it this way until the orders overwhelm her and she is no longer able to do it on her own. Monica Kennedy is living her dream, every single day. “Before being the mother of two, I always worked and the idea of staying at home with my kids scared me in the sense that I feared I would be bored and would have too much time on my hands. So far, everything has turned out to be the opposite”, shares Monica. “Olivia, our second child, is still too young to go to school, so I take care of her, the house, the family and I work on my business. Being extra busy keeps me sane”. Monica claims that never giving up, being organized and knowing her limits and that she has the support of her family have been key to her success. Concerning how she manages any down moments, Monica says: “I don´t waste my time dwelling on failures, there is no point. What is done, is done. My business is based on customer feedback so if there is any problem with an item I encourage them to send it back and I will fix it”. Tuffcooki started out with just handbags and has extended her line to include embellished T-shirts, jewelry, cosmetic bags and eye pillows. And the Winner Is - Francisco Pérez Gandul, Author of Celda 211!!!! In 2001, I had just published The Challenge of Writing and Publishing, when I received an e-mail from an editor at a renowned newspaper in Spain. The editor was Francisco Pérez Gandul, who had read a review copy of my book, and in his e-mail he shared with me his dreams of becoming a published author and seeing his novel -a prison-thriller- be made into a film. I read his manuscript, and I gave it back to him with my impressions. I remember discussing it with him over a "caña" (Spanish draft beer) in a café in Seville. Oh, how I wish I had kept that copy! It was not my choice of literature, but the story was compelling and the writing was strong. 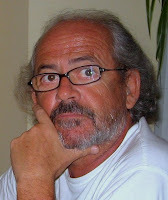 Paco Pérez (as he is known to friends and family) and I became good friends and writing buddies. In 2004, when I was expecting my second child, I visited him at the Sevilla Book Fair, where he was signing copies of Celda 211, and that was his first taste of success. The sales of the book were not that good, but he never lost hope for taking it to the big screen. We would talk about it, then e-mail about it when I moved to Florida. His wife Carmen wrote to me to tell me Paco had heart-trouble and had to leave his work at the newspaper. He recovered and continued to knock on the door of production companies, until one had the guts to make it into a movie. Celda 211 (Cell 211) has swept the Spanish Goya Film Awards (Premios Goya), with 8 Awards, to include Best Film and best Adaptation. It is a prison-thriller which features a mutiny during a prison-guard´s first day of work.The real winner of the Goya Awards is Francisco Pérez Gandul. Without his novel, the movie would not exist. Sales of the novel have sky-rocketed. Today, when I went for my run on the beach, I ran farther and faster, motivated by my friend's success which is fuel for my own dreams and goals. Thank you and congratulations, dear Paco, and I hope to see you soon - in Hollywood! To the right, my 5 year-old drawing on her sheets. Not only did I allow her to do this; I encouraged her. It was actually her sister's idea, and I thought it was grand. Instead of buying a new set of sheets, they decorated their own! As a woman, I am often guilt-ridden because I need to juggle work, my hobbies and my writing with parenting. I know I am not alone in this. I strive to take care of my own needs, because if mom is not ok, then she cannot take proper care of her offspring. However, sometimes we need to make choices. Today I recalled that 3 years ago, I was offered a contract to write a parenting book on commission. The catch was that I had to churn it out in a month or two. I'm a writer, and I love to write and as an author, I need to be published. Yet, after giving it some thought, I turned down the offer. I turned down the advance, I turned down writing the sure-fire book. It seemed contradictory to me to be writing a book about creative parenting if that was to affect the quality of my own parenting. I was already weighed down by free-lancing jobs and another book. I am a writer, but mainly I am a creative person, always looking for ways to express myself - be it through dance, art, photography or simple conversation. I am also a mom, but a mom who had kids not because it was the thing to do, but because it was the thing I wanted to do. And from the very beginning I took it on as a life-project. It is just as creative for me as writing. That is why I do "different"and offbeat activities with my kids ... and that is perhaps why they are as creative as I would wish for them to be. And yet ... I struggle to keep that balance because I need to make a living, and I need to write, I need to dance, and I need to ... be a mom. A couple of days ago, I was having blood drawn for my yearly check-up. The nurse looked at my arm and said: "You must work out a lot!". When I laid down for my exploration, another nurse said "You have such a flat stomach! You are so lucky!". The fact is that I do not work out as much as I would like to, and that I am not as "lucky" as some people think in that arena. It is all a matter of a trite but true concept I have recently been reminded of by others, which is: "consistency over time". Of course I am proud and happy to look like the picture here at the ripe age of 46 and with two young kids in tow! But this is largely the result of having exercised 2 to 3 times a week in some way or another for my entire life, since I was around 12. It did not happen overnight not is it the result of spending hours at the gym or starving myself today. Consistency over time is also how I have written and published 15 books over the span of 17 years. I never waited for "the right time", when I would have money and a few days or weeks off to sit and write a book. I have always written more or less regularly, no matter what, whether single or in a relationship, with our without money or work, after deaths, marriages, separations and having babies. Life has a way of getting in the way while we are alive, and Rome was not built in one day. We seldom see the results of our actions immediately. But if we keep up a moderate effort to achieve any goal we set our minds to reaching, whether it be physical, intellectual, emotional or material, eventually it pays off. There is no secret to getting things done, other than doing them! I am inspired when I see others pursuing their dreams, doing what they want and need to do in order to feel their life is a life worth living. So, excuse me, since I have to work on my next book - but that will be after I go for a run and tuck my girls in bed, and once I´m done with my freelancing work on a Sunday evening while others watch the Superbowl. Boredom is an emotional state experienced during periods lacking activity or when individuals are uninterested in the activities presented to them. Boredom: a chosen state of mind brought on by laziness and the firm belief that others are in charge of the so supposedly afflicted person's own happiness. I do not believe in boredom. I am puzzled by those who affirm they are ever bored! How is this possible? There are not enough hours in the day to accomplish all the things that I enjoy doing. This is not to say I am a "Type A" personality that gets a rush out of hyperactivity. I also cherish down-time: reading, walking, thinking, napping, sleeping in, conversing, being in solitude and in silence ... And I enjoy it all. Boredom is, as stated above, "a chosen state of mind". If you have an inquisitive mind, you will never be bored. The hunger for learning, for living, for feeling will always keep you engaged. If you enjoy reading, writing, painting, or any other form of art or self-expression, boredom is an impossibility. Even if you find yourself in a situation that is not of your choice, such as a dull job or an uninteresting party your significant other dragged you to ... If you embrace it as a learning experience, as food for your art (we all have artistic tendencies), you will find it interesting and glean something from it. You will therefore enjoy it! I am grateful that I do not know boredom. And no, I am not being smug about it, just grateful.